From Wright Memorial to Museum for the Space Age | Smithsonian Institution ArchivesFrom Wright Memorial to Museum for the Space Age. The building designs of the National Air (and Space) Museum reflect the contemporary concerns of aviation and space flight. On July 1, 2016, the current National Air and Space Museum (NASM) building, covered with a Tenessee pink marble façade and recessed glass bays, celebrated its 40th anniversary. For this, NASM reopened its central exhibition, the Boeing Milestones of Flight Hall, and hosted various events including greetings from Mars and from International Space Station, and overnight birthday party. However, the story to find the logical home for Smithsonian’s air and space collection has a much longer history. Right after the National Air Museum Bill in 1946 to build the National Air Museum (NAM) as a separate bureau of the Smithsonian, the Advisory Board of the NAM looked for suitable place for “a shrine for American Aviation.” At first, they preferred a spacious area in a Washington suburb, such as Arlington Farm and Theodore Roosevelt Island, to display a maximum of 200 full-size aircraft and to include an outdoor amphitheatre for ceremonials. 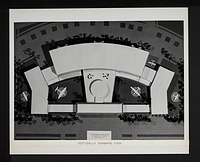 The proposed building plan in the report by Public Buildings Administration, completed in June 1949, suggested how NAM could commemorate the American heritage of aviation technology beginning with the Wright Brothers. Among three main exhibit halls, the “Wright Brothers Memorial” was the primary attraction. To commemorate the first flight in history, the gallery was designed to depict the local atmosphere of Kitty Hawk in 1903 placing it in a cyclorama enclosed in glass, surrounded by a rotunda. 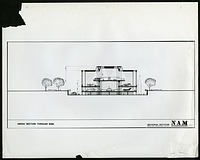 However, as the proposed Arlington Farm site became unavailable because of the extension of Arlington Cemetery, the Advisory Board of the NAM needed to find another place. 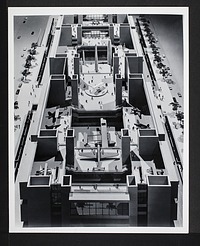 The new Secretary of the Smithsonian, Leonard Carmichael, and the Advisory Board of the NAM created a new momentum to locate NAM close to the other Smithsonian buildings on the National Mall for “the maximum service to the millions of visitors who will want to see this museum.” After a series of meetings, the Smithsonian Board of Regents allocated a site to the NAM bounded by Independence Avenue on the north, 9th Street on the east, 12th Street on the west, and C Street on the south. Accordingly, a new building design, called the “wine glass,” was developed in 1955 by the New York architectural firm of McKim, Mead, and White. The proposed site, however, caused a conflict with another plan for the redevelopment of southwest Washington, known as the Zeckendorf plan. The current NASM building was finally developed in 1972 by Gyo Obata of Hellmuth, Obata & Kassabaum after the long struggle for the appropriation for the building construction of $40 million USD. Now, the 40-year old NASM, which has welcomed hundreds of millions of people, is planning another revitalization with a complete overhaul of inside and outside the building in order, which will write a new history of the most visited museum in the country.